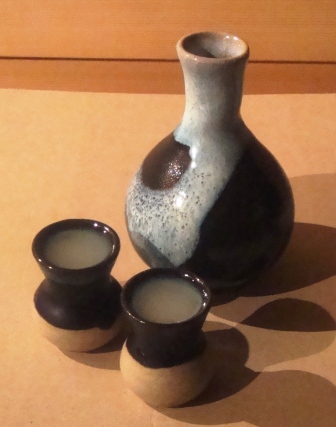 Amazake can be considered a “precursor” to sake. In sake fermentation, steamed rice starches are converted to sugar with the use of a catalyst named kome koji–fungus-infected rice; then the sugar is fermented using conventional saccaromycetes. And as is with the unfermented barley-based soft drink Malta, there is a Japanese version using rice: amazake. Amazake is, theoretically, the sugary mash that is formed when the fungus A. oriazye saccarifies starches in the rice, but before yeast turns those sugars into alcohol. Amazake is refrigerated or consumed shortly after the conversion is comeplete. However, if the mash is allowed to continue sitting at room temperature, it will start to bubble and fizz, as sugar is metabolized into alcohol and carbon dioxide. You get a mild sake anyway: hard, “Hakkō” amazake if you will. If you make amazake out of brown (chairo) rice you get a drink that is much more flavorful than the traditional recipe that calls for glutinous white rice. Sweet glutinous white rice forms the key ingredient in the Japanese dessert “mochi.” This sweet rice is available in a brown version too, with all the more rounded umami flavor characteristics you would expect. Because koji has fermented out all the sugar that is in a conventional amazake, this version adds back a bit of rice syrup solids to balance the tartness of the citric acid used to prevent wild yeast infection. The drink is back-sweetened, then pasteurized in bottles. Served slightly chilled, the flavor is a sweet-tart burst, balanced with umami flavors of toast, caramel and mushroom. This entry was posted in Uncategorized and tagged ale, amazake recipe, fermentation, homebrewing, koji, sake, umami.